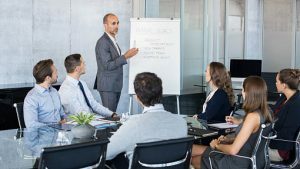 Public speaking skills are always in high demand, and if you’ve been in the business world for any length of time, you’ve likely been called upon to present an end-of-the-year report to the board of directors or share a new marketing initiative with senior leadership. So, it’s important to hone your public speaking skills to ensure you always make a good impression and put your best foot forward. If you have a fear of public speaking, you’re far from alone. According to a survey conducted by Statistic Brain, 74% of people say they suffer from speech anxiety. In fact, there’s even a name for it—glossophobia. Here are a few quick tips to keep in mind to help alleviate your presentation anxiety. As the saying goes, practice makes perfect. This one may be the most obvious, but it’s also the most important. In addition to practicing your presentation for a perfect scenario, you should also practice how you would handle situations that don’t go according to plan. Anticipating and practicing your response to tricky situations, like technology issues, for example, will help you keep your cool on the off chance they arise. It’s also important to note that there’s a key distinction between practicing and memorizing. Don’t memorize your presentation word for word. You’ll be too dependent on following a tight script and less prepared to adjust when things don’t go exactly to plan. Whether it’s your company boardroom or a meeting room in a local hotel, remove the element of surprise by visiting the space where your presentation will take place a couple days ahead of time. If possible, try to recreate the conditions of the big day during your visit. Test the A/V system and make sure your laptop or other technology you will use is compatible, figure out how to adjust the temperature in the room, analyze the seating layout, and make note of where the facilities are located. The more comfortable and confident you can make yourself feel in the meeting space, the easier it will be to focus on giving an outstanding presentation. Eating before a big presentation is important, but that doesn’t mean devouring a heavy, full-course meal right before you take the stage. Keep it light and stick to trusted foods you know won’t upset your stomach or cause an allergic reaction. Eat foods that are rich in soluble fiber, like oatmeal or fruit, and try to avoid fatty foods, caffeine, and alcohol. And be sure to drink plenty of water! Dehydration can lead to dry mouth, dizziness, and many other issues that can easily derail your presentation. There are also a wide variety of herbal teas that can help soothe a scratchy throat or calm your nerves before show time. No, that doesn’t mean you should wear pajama pants and a t-shirt, but you should wear clothes that you not only feel comfortable in, but also feel confident wearing. Whether it’s a favorite power suit perfectly tailored to fit your body or a loose-fitting outfit that gives you plenty of room to breathe and move around, feeling comfortable in your clothes will help you feel more comfortable in with your presentation. Whether it’s having a printed copy of your speech in your briefcase or a second flash drive with your PowerPoint presentation in your pocket, sometimes just knowing you have a backup plan is enough to calm your nerves and focus on the presentation. In all likelihood, you won’t even need the safety net, but the psychological effect of knowing it’s there can have a positive impact. These are just a few small things you can do to ease presentation anxiety. If you’re looking for more hands-on, in-depth training, consider hiring a speech coach or join your local Toastmasters group. Public speaking doesn’t come naturally for everyone, but it’s an important skill that can be mastered with a little practice and preparation. How do you fight through presentation anxiety? Let us know your favorite tips in the comments section below. This article has great tips for presenting…never really thought about eating trusted foods! Thank you for the coaching you provide. Years ago when I first started public speaking, I recorded my speech and played it back. Was shocked to hear how many times I said “um”. Your first tip “Practice, practice, practice” helped me polish my presentation. Thanks for the tips. I make sure I have a good outline of what I am going to speak about. It usually is in a very simple point format. I do a practice run of my presentation and record it on my I-Pad so I can listen to it while walking on my treadmill!